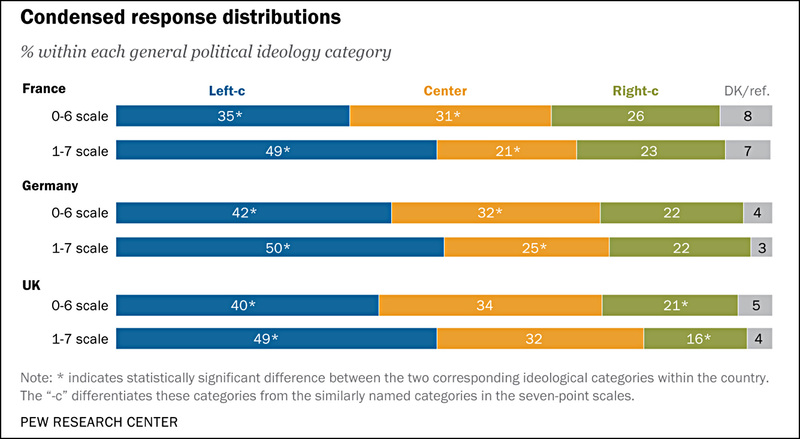 In all three countries, the 1-7 scale produced higher results for the ideology defined by a low number (which happened to be lefties in this case). The differences weren’t small, either. Take a look at France, where the percentage of lefties increases from 35 percent to 49 percent. That’s a huge difference, and all because the ranking system changed by one digit. This is a great example of how fragile polling can be. We obsess over things like the margin of error, which might be responsible for a point or two of error, when there are other things that can introduce errors of a dozen points or more. Of course, it’s not really correct to talk about “errors” here since we don’t know what the true value is or whether there even is one. What a study like this shows is probably that (a) lots of people are kind of fuzzy about where they stand, and (b) lots of people aren’t very good at math. You can see the same sort of thing with question wording. This is especially evident in polls about abortion, where seemingly small changes in question wording can produce differences of ten or twenty points. This is why you should always be skeptical when you see a headline shouting about a big shift in abortion sentiment. If the change really is big, it’s almost certainly because of question wording, not because the American public has really shifted its views significantly. Anyway, this is a good example of just how hard opinion polling is. Who would have guessed that a tiny change in scale would produce wild results like this?